Alamos (pop. 6,000* - elevation 1,245 ft.), located in the foothills of the Sierra Madre Occidental in Sonora, is one of Mexico's most splendid colonial cities. As the most northern of the colonial pueblos, Alamos has a rich history of conquistadors, mining barons, imperialists and revolutionaries. Upon entering the city, you'll experience a feeling of a different age, of Spanish romanticism, of Old Mexico. Alamos today is known for it's charming atmosphere and warm, friendly people, where one can leave the hurried life of the urban areas of North America and relax into the serene lifestyle of this small colonial gem. *The population hovers around 6,000 people in the city and another 4,000 inhabitants in outlying areas yet Alamos still retains the grandeur of it's colonial past. The climate, due to its position in the Sierras, retains cool, pleasant days in the winter, some hot days in the summer and spectacular rain storms in July & August. The area offers almost 360 days of sunshine. 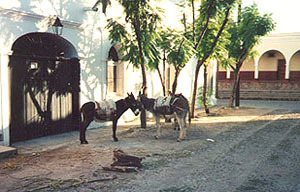 Alamos offers the visitor many attractions, festivals and activites. This enchanted pueblo is a Mexican Historical Monument and a Sonoran State Historical Site. Rumor has it that Alamos may be a United Nations World Heritage Site. 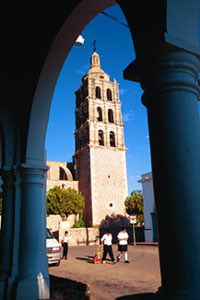 Besides the feeling of being in another era, Alamos offers something for everyone. Birdwatching, indigenous villages, horseback riding, history, photography and much more. The city's historic and cultural attractions are numerous. Much of what there is to see is within walking distance of lovely Plaza de Armas. 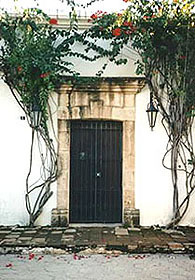 Most museums, monuments, and lodging are housed in buildings dating to the 17th and 18th century. A must-see in Alamos are the city's strolling muscians, known as Estudiantina. Like their counterparts in Guanajuato, these Spanish-style troubadours perform while strolling through the city streets. Alamos also claims to be the "jumping bean" capital of the world. 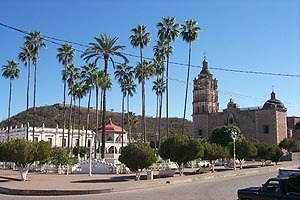 Alamos is located in the southern part of Sonora in northwestern Mexico. It is easily accessible from both Mexico and the rest of the world by automobile, bus, or air at one of Sonora's major cities.